HCM City (VNA) – The Vietnam Motorshow 2017, themed “Connected Technology for Smart Moving”, kicked off at the Saigon Exhibition and Convention Centre in Ho Chi Minh City on August 1. 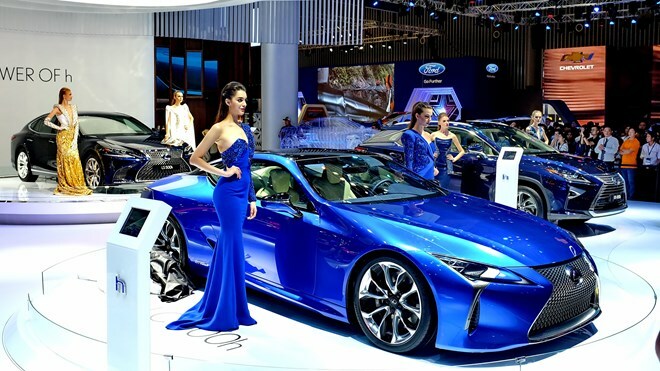 More than 80 models of 12 brands, namely Chevrolet, Ford, Do Thanh, Fuso, Honda, Isuzu, Lexus, Mercedes-Benz, Mitsubishi, Nissan, Suzuki and Toyota, are being displayed at the event. Outstanding new designs include XM Concept of Mitsubishi; LC500h 2017, LS 2018 and NX300 2018 of Lexus; Avanza 2017, Alphard 2017, Wigo 2017 and Corolla Altis 2017 of Toyota; GLA 2018 of Mercedes-Benz; and Celerio 2017 of Suzuki. The show also attracts 50 companies specilising in automobile-related products and services. It is a platform for car brands to seek customers and partners. Meanwhile, visitors will have a chance to test drive and receive advice on various car designs. The show also features seminars on “women and cars”, “technology and cars”, and “connected technology for smart moving”.